Like all good companies who are committed to continuous improvement, you can positively impact your business by implementing fundamental Lean Manufacturing concepts immediately with minimal outside training. Here are a few ways that your tooling provider can help you. 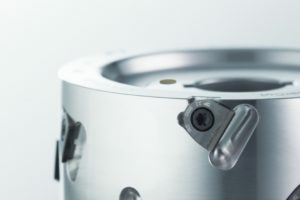 Professional tool manufacturers issue unique part numbers to every piece of tooling and follow strictly to the issuance of new part numbers any time there is a change to form, fit or function of a tool or component. Through tool management, by a competent vendor, all related information including tool drawings, spare part lists, machine-line layouts, and so forth should be kept in organized physical and or electronic files. In this way, correct replacement parts can be ordered efficiently and on-time and issues can be identified and solved rapidly with the proper information at hand. The latest development in tool management is the evolution of intelligent tooling. At Leitz, we are using Embedded Chip Technology, RFID Devices, and Integrated QR Codes as a part of each individual tool and most component pieces. Through this technology, all types of information about individual tools can be gathered and accessed directly from the tool. In the case of an embedded chip, the information stays with the tool. With a QR code information is accessed from company or cloud databases when the QR code has been scanned. Tool organization is just the beginning considering the coming advancements with the so-called “Smart Factory” and Industry 4.0. Processes in woodworking are becoming more complex and sophisticated all the time. The increasing diversity of material and surfaces (high-gloss laminates and new, harder to machine composite materials with PDMI and MDI binders as examples) require very specific machining requirements. Additionally, new approaches to individualized mass production are ramping-up the need to understand what is happening in the machining environment at all times. On top of the processes complexity, operators are being asked to do more and more. These machine technicians need to be process-specialists and have the knowledge necessary to run today’s sophisticated machinery. Essentially, we are reaching the limit of skill required and mind power available to manage the data in front of us and to manage it in a way that produces the desired products in an optimal and safe environment. Adding to the issue, the current “recruiting crisis” in the United States keeps manufacturers under pressure to get operators hired and trained as fast as possible. With the risk of mistakes so high it is critical to rely on the tool provider to keep relevant information about tool specifications, and running parameters like cutting speeds, feed rates, etc. readily available and to ensure operators understand the effect on the application. The traditional methods of educating and safeguarding at the operator level are a must from a competent tool supplier. These include hands-on supplier training of operators; running limits engraved on the tools; proper offsets and reference points provided with tools after each service; and tool systems, like insert tools, that have fail-safe consistency built into the design. The availability of information comes in the form of cataloged references, user guides and service reports that are often available in paper and or electronic format. However, in the new era of the Internet of Things, companies like Leitz will make that information available on-demand. With integrated chip technology, today’s tools are being linked to the respective user reference material located on company servers or in the cloud. Service history is likewise being recorded as it is completed. In the future, all necessary information will be readily accessed at the machine by operators or read by the machine directly. A further application of newer advanced machinery and intelligent tools is the simulation of the machining process before actual start-up. In this type of scenario, a 3-D model would normally be part of the information contained on an RFID Chip. This is very useful once tool and machine communication is established. Since the exact geometry and dimension of the tool can be read by the machine, the software can actually simulate the machining process. This ensures safety during tool changes and prevents crashes due to incorrect programming. This type of simulation is especially important for processes with higher numbers of machining steps like in the production windows, doors, and flooring. With the changes in the way that products are produced today the manufacturing process needs to be flexible at all times. Consumer tastes are driving a need to make products that are unique and individualized. The long production runs of the past are all but gone. With this in mind, breaking-down set-ups and even changing over entire production lines must be done quickly, efficiently and correctly. Experienced tool suppliers can help with these needs. Tools and tool systems can be designed so that parts can be run using multiple spindles and combinations of tool components. Here design of the system up-front is critical and involves a close partnership between machine maker, tool provider and customer. Also, keeping the exact specifications at hand using visual organization techniques matching tools and spindle positions can be invaluable. Tooling with constant diameters, reference points, and repeatable profiles can be utilized. Leitz makes insert tools that often times can be changed on the machine and require no adjustment from tool change to tool change. Moreover, systems of insert tools can be designed so that one tool can be removed and another put in its place and there is little or no adjustment of the spindle required in the change-over process. Service is another area of concern for tools like Polycrystalline Diamond Tipped tools where the specifications of the tools are essentially modified during the service process. Accurate service records are maintained by competent suppliers and these records can travel with the tools so that offsets can be programmed into the machine upon tool change making the change-over process more efficient and reliable. As stated before, the future will involve keeping all relevant information with the tool at all times. This, of course, will be made much easier as intelligent tools, reading devices, and machines evolve to assist operators in the tool-change and machine-line change-over process. Installing a lean culture or embarking on a lean journey is a decision generally made at the management level. We have identified ways where continuous improvement can be initiated through the use of lean building blocks with or without total lean commitment. High quality, innovative tool manufacturing and servicing companies like Leitz can be a partner in these lean initiatives both now, with more basic tool management strategies, and in the future by providing intelligent tools as a part of the Industry 4.0 evolution.